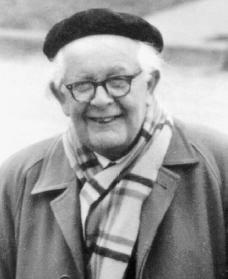 The Swiss psychologist and educator Jean Piaget is famous for his learning theories based on different stages in the development of children's intelligence. Jean Piaget was born on August 9, 1896, in Neuchâtel, Switzerland, the son of a historian. Much of Piaget's childhood was influenced by what he saw in his father, a man intensely dedicated to his studies and work. Because of this, at an early age Piaget began passing up recreation for studying, particularly the study of the natural sciences. When he was eleven, his notes on a rare part-albino (having extremely pale or light skin) sparrow were published, the first of hundreds of articles and over fifty books. Several times, when submitting his works to be published in various magazines, Piaget was forced to keep his young age a secret. Many editors felt that a young author had very little credibility. Piaget's help in classifying Neuchâtel's natural-history museum collection inspired his study of mollusks (shellfish). One article, written when he was fifteen, led to a job offer at a natural history museum in Geneva, Switzerland; he declined in order to continue his education. At Neuchâtel University he finished natural science studies in 1916 and earned a doctoral degree for research on mollusks in 1918.
these quantitative (expressed as an amount) tests were too strict and saw that children's incorrect answers better revealed their qualitative thinking (quality of thinking) at various stages of development. This led to the question he would spend the rest of his life studying: How do children learn? After 1921 Piaget was director of research, assistant director, and then codirector at the Jean Jacques Rousseau Institute, later part of Geneva University, where he was the professor of history in scientific thought (1929–1939). He also taught at universities in Paris, Lausanne, and Neuchâtel. He was chairman of the International Bureau of Education and was a Swiss delegate to United Nations Economic and Scientific Committee (UNESCO). In 1955 he founded the Center for Genetic Epistemology in Geneva with funds from the Rockefeller Foundation, and in 1956 he founded and became director of the Institute for Educational Science in Geneva. Piaget found four stages of mental growth while studying children, particularly his own: a sensory-motor stage, from birth to age two, when mental structures concentrate on concrete (or real) objects; a pre-operational stage, from age two to seven, when children learn symbols in language, fantasy, play, and dreams; a concrete operational stage, from age seven to eleven, when children master classification, relationships, numbers, and ways of reasoning (arguing to a conclusion) about them; finally, a formal operational stage, from age eleven, when they begin to master independent thought and other people's thinking. Piaget believed that children's understanding through at least the first three stages differ from those of adults and are based on actively exploring the environment (surroundings) rather than on language understanding. During these stages children learn naturally without punishment or reward. Piaget saw nature (heredity, or characteristics passed down from parents) and nurture (environment) as related and equally as important, with neither being the final answer. He found children's ideas about nature neither inherited (passed down from parents) nor learned but constructed from their mental structures and experiences. Mental growth takes place by integration, or learning higher ideas by absorbing lower-level ideas, and by substitution, or replacing early explanations of an occurrence or idea with a more reasonable explanation. Children learn in stages in an upward spiral of understanding, with the same problems attacked and solved more completely at each higher level. Harvard psychologist Jerome Bruner (1915–) and others introduced Piaget's ideas to the United States around 1956, after his books were translated into English. The goal of American education in the late 1950s, to teach children how to think, called for further interest in Piaget's ideas. His defined stages of when children's concepts change and mature came from experiments with children. These ideas are currently favored over the later developed stimulus-response theory (to excite in order to get response) of behaviorist (doctors who focus on the behaviors of their subjects) psychologists, who have studied animal learning. Piaget's theories developed over years. Further explanations and experiments were performed, but these refinements did not alter his basic beliefs or theories. Piaget received honorary degrees from Oxford and Harvard universities and made many impressive guest appearances at conferences concerning childhood development and learning. He remained a quiet figure, though, preferring to avoid the spotlight. This kind of lifestyle allowed him to further develop his theories. Piaget kept himself to a strict personal schedule that filled his entire day. He awoke every morning at four and wrote at least four publishable pages before teaching classes or attending meetings. After lunch he would take walks and ponder on his interests. "I always like to think on a problem before reading about it," he said. He read extensively in the evening before going to bed. Every summer he vacationed in the Alpine Mountains of Europe and wrote many works. Piaget died on September 17, 1980 in Geneva, Switzerland, and was remembered by the New York Times as the man whose theories were "as liberating [freeing] and revolutionary as Sigmund Freud's [1856–1939] earlier insights into the stages of human emotional life. Many have hailed him as one of the country's most creative scientific thinkers." Evans, Richard I. Jean Piaget, the Man and His Ideas. New York: E. P. Dutton, 1973. Fravell, John H. The Developmental Psychology of Jean Piaget. Princeton, NJ: Van Nostrand Press, 1963. Furth, Hans G. Piaget and Knowledge: Theoretical Foundations. 2nd ed. Chicago: University of Chicago Press, 1981.